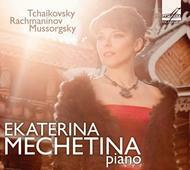 Firma Melodiya presents a solo album by Ekaterina Mechetina, a wonderful Russian pianist of the new generation. A graduate of the Moscow Conservatory, where she studied under associate professor Vladimir Ovchinnikov and professor Sergey Dorensky, and a laureate of the Youth Prize �Triumph� and seven prestigious international competitions, Ekaterina Mechetina began to conquer the musical Olympus at a very early age. The young pianist�s first concert took place when she was ten. Her pianistic gift was acknowledged by some of the great masters of 20th century music art - Rodion Shchedrin entrusted her with the world premiere of his sixth piano concert after he heard her for the first time; Mstislav Rosropovich invited her to perform with the orchestra he conducted. Ekaterina Mechetina has won over the audiences of some of the world�s best venues. Today, the pianist plays over sixty concerts annually, performing at some of the largest concert halls. Her repertoire includes about fifty piano concertos and dozens of solo programmes. She has worked with outstanding soloists, conductors, symphony and choir collectives of Russia and other countries. The pianist�s perfect mastery, bright creative individuality and amazing artistic charisma have won the hearts of listeners around the world. On this album, Ekaterina Mechetina appears as an inspired interpreter of Russian classical piano music. Apart from one of the greatest cycles of Russian music of the 19th century, Modest Mussorgsky�s Pictures at an Exhibition, it also includes eight of the �tudes-tableaux from Rachmaninov�s Op.33 and two virtuosic pieces by Tchaikovsky � Dumka and Theme with Variations.